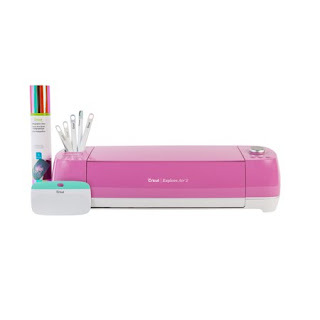 Head over and check out this *POPULAR* Cricut Explore Air 2 Fuchsia Bundle $220 (Retail $269.99). Exclusive to Walmart.com! The Fuchsia Explore Air 2 Bundle includes the Cricut Explore Air 2 Fuchsia Machine ($249.99), Cricut Weeding Tool Kit ($24.99), a Cricut XL Scraper ($9.99) and 1 role of Cricut Holographic Vinyl, Mermaid ($12.99), a total value of $297.96! Cut and write up to 2X faster than previous Cricut Explore models with this DIY speed machine. The Cricut Explore Air 2 cuts over 100 materials everything from cardstock, vinyl and iron-on to specialty materials like glitter paper, cork, and bonded fabric. Quickly. Beautifully. From cards to custom T-shirts to home decor, Cricut makes it easy to realize your creative vision. Design on the go on your laptop, iPad or iPhone. Browse and play with thousands of images, fonts, and ready-to-make projects. Or create your own design from scratch.